College Chemistry Canada (C3) is a non-profit organization dedicated to the promotion of the teaching of chemistry primarily at the college and university level. Originally an affiliate of the Two Year College Chemistry Conference (2YC3) in the U.S., C3 became an independent organization in 1976. Dedicated to providing professional development opportunities for teachers of chemistry, C3 has sponsored an annual conference each year since 1972. These conferences alternate between east and west and have been hosted by colleges from Newfoundland to the Yukon Territory to Rhode Island. In 1985 the organization became incorporated as a non-profit association. In addition to the annual conference, C3 gives a number of awards to students and teachers of chemistry. A quarterly newsletter, the C3 News, is published to advertise the conference and provide a means of communication between members. College Chemistry Canada is governed by a Board of Directors and an Executive. The latter consists of the President, Past President or President Elect, Secretary, Treasurer, Editor, Conference Coordinator, and Web Editor. The Board of Directors consists of the Executive and representatives from each of the regions: BC/Yukon, Prairies, Ontario, Quebec, and the Atlantic Provinces. Each of the Executive positions is for a term of two years while the Directors hold one year terms. Elections are held at the Annual General Meeting of the organization. 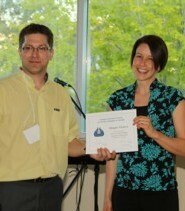 Megan Perkins accepts the Host Institution Student Award for 2010 at the 37th Annual conference in Kamloops. Award information can be found on the Awards page.